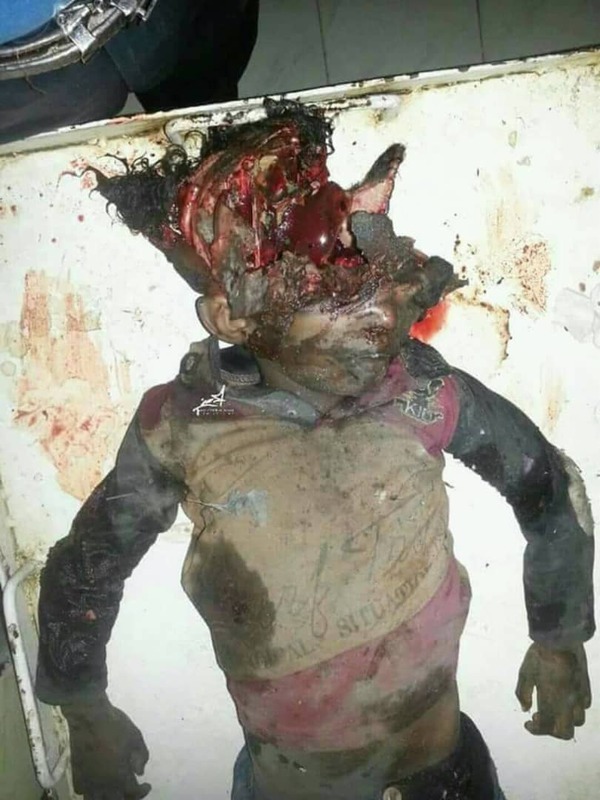 Note: This post contains graphic images and video from Yemen, where American bombs used by Saudi coalition forces have resulted in horrific scenes of death—many involving children. The video comes after the second paragraph in the story, while the images come at the conclusion. The photos are not obscured in any way—this will be the last warning. Admittedly, it’s not an easy photograph to look at. 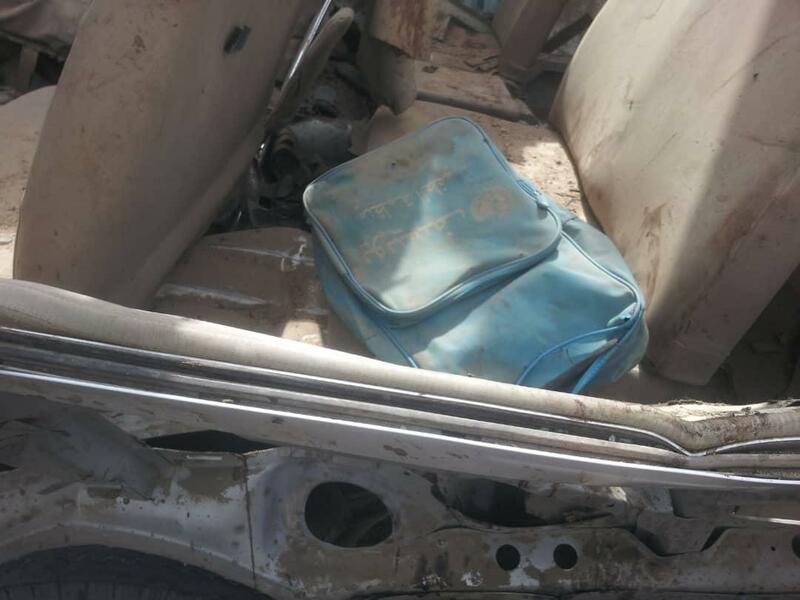 Children—or at least what’s left of them after American bombs ripped through their school bus in Saada, Yemen, on Aug. 9—lie in a heap in the back of a pickup truck. It’s a veritable mosaic of human destruction. Vibrant hues of red, pink, blue, and yellow are punctuated by blacks, greys, and skin tones. Muscle tissue erupts from shredded flesh, mouths hang slightly agape, and charred, mutilated limbs protrude like gaunt twigs, their sources indistinguishable amidst the carnage. The video footage is even worse. A minute-long tape shows a father sobbing and wailing hysterically, shaking the pickup carrying his son’s corpse. He desperately kisses the dead boy’s hand, and for moment lifts him by the arm in an apparent effort to wake him. As he lays the body back down, his face betrays mournful resignation to his new reality. Another clip. Children’s screams and frantic shouts sound in the background as the camera pans across bodies—some dead, looking like debris, others attempting to crawl from the blast zone, bloodied and twisted. 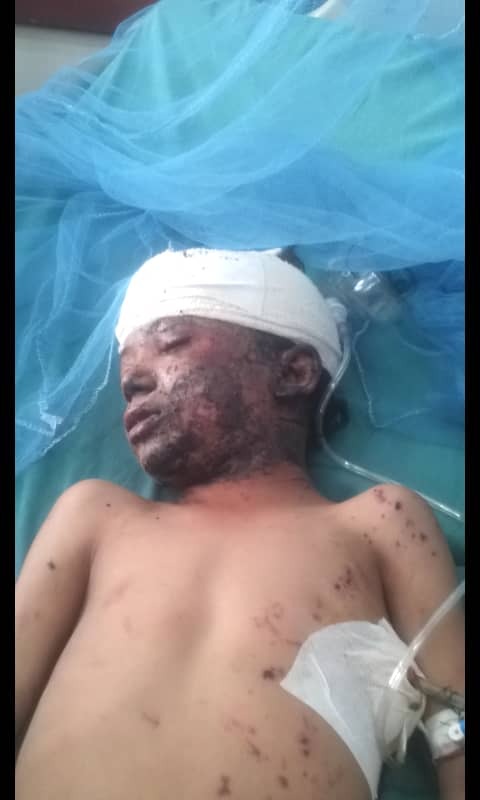 One child sits in the mud, shell-shocked, his leg shredded by the blast. 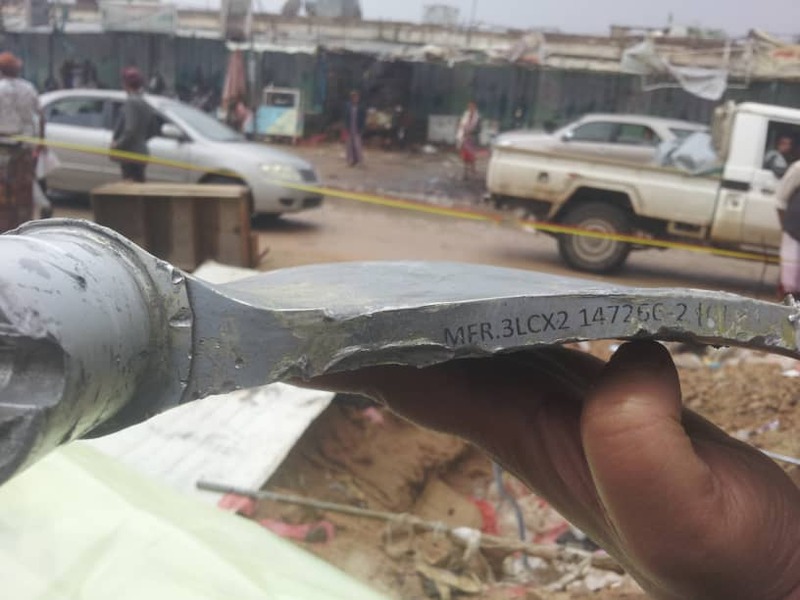 Saying it again & again: These are American-made bombs dropped on children by the Saudis and Emiratis with refueling and targeting support from the U.S. Army. 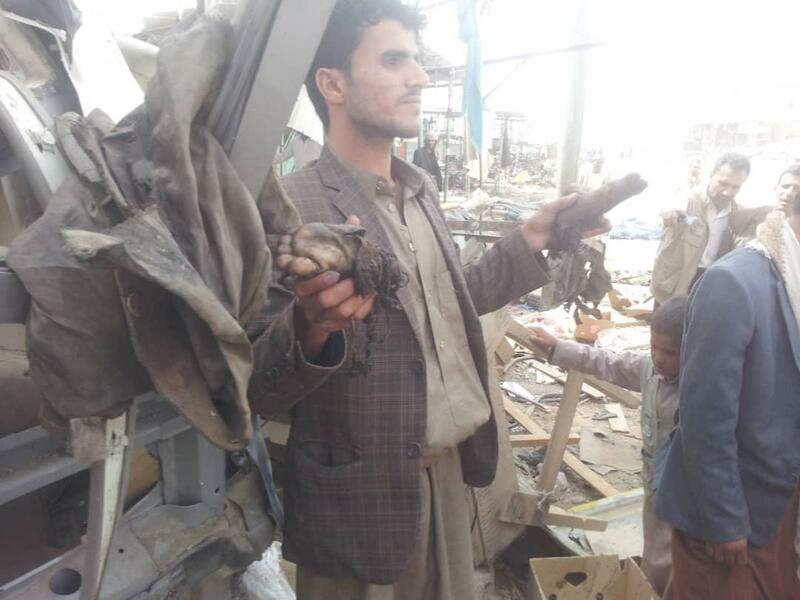 America and Britain is just as complicit as Saudi & UAE in #YEMEN war crimes. These searing images document a masterwork of unbounded cruelty for which American tax dollars supplied the medium, and which American apathy has enabled. For the last three years, the United States has been providing military and logistical support to a Saudi-led coalition of Sunni Muslim countries trying to restore Yemen’s internationally recognized Hadi government which was deposed by Shia Houthi rebels in 2015. Claiming to be fighting against Iranian influence in the region (a connection the rebels deny), the coalition has been targeting civilians and civilian infrastructure. The Saada attack killed over 50 people, 44 of whom were children between the ages of six and 11. Despite their propensity to offend viewer sensibilities, these scenes are necessary for American audiences. Images have a unique power to humanize brutality—to connect terms like “civilian casualties” and “collateral” to faces across the globe belonging to people who, as it turns out, look an awful lot like us. Footage can sway public opinion and catalyze policy change by delivering us from our detachment and laying bare our egocentrism. The editors of Jet Magazine understood this power when they published photographs of Emmett Till’s battered, decaying body in 1955. So too did the editors of The Cleveland Plain Dealer when they printed Ron Haeberle’s pictures of the My Lai Massacre 13 years later. In this environment, access to political insiders (and by extension juicy scoops) has become currency. The perfect storm of incentives has given rise to a comfortable arrangement for all parties involved—advertisers, executives, sources, and anchors. To maintain balance between the different agendas, coverage is sanitized. As a rule, coverage today generally avoids painting American involvements abroad in too negative a light. Graphic images are used sparingly, like when Gary Knight’s photograph of the dead Marine in Iraq made the rounds, or when Nilüfer Demir’s picture of a drowned 3-year-old Syrian refugee named Alan Kurdi went viral. However, the worst carnage resulting from current US foreign policy is never shown. In Hayes’ 2-minute Aug. 9 segment on the school bus bombing—the first airtime MSNBC had given Yemen in a year—no dead bodies or catastrophic injuries were shown. The next day, Hayes’ colleague, Stephanie Ruhle, followed up. Once again, the dead and the grievously wounded were left off the air. None of MSNBC’s coverage since the attack has shown the full extent of the violence. Print outlets haven’t done any better. Reuters, Wall Street Journal, Washington Post, and The New York Times also declined to include the worst images. This is not to say there has been no good coverage. In an Aug. 14 segment, Democracy Now! showed bodies. Meanwhile, in its Aug. 10 report, CNN aired the clip of the grieving father finding his son’s body in the back of the pickup. However, the clip was cut just before the devastated man lifts the corpse from the indistinguishable mass of human remains. In an Aug. 17 broadcast, CNN went so far as to display a map of fatal coalition attacks on civilians in Yemen, identifying each by the weapons manufacturer responsible. Even so, without showing carnage, the coverage fundamentally fails to capture the humanity of the war and leaves the Yemeni people largely without an avenue to share their experience with the world. In response, many have turned to social media. Abu Ezzeddine of Sanaa, for example, has taken to Twitter since the conflict began, sharing graphic videos from his country. Ezzeddine was wounded four years ago when a suicide bomber attacked his mosque. The injuries to his feet he sustained are still not healed, and he now faces amputation. Supply shortages at government medical facilities, along with the blockade, have left him unable to get affordable treatment. Western media’s general reluctance to show the full extent of the violence in Yemen is doubly frustrating for journalists living and working in the war-torn country. Thus far, the outcry from Americans over the US’ role in the Yemen crisis has been predictably—and to an extent, intentionally—muted. The Saada school bus bombing never even trended on Twitter, nor did many take notice when the US State Department deferred to Saudi Arabia to conduct its own internal investigation into the war crime it had apparently committed. 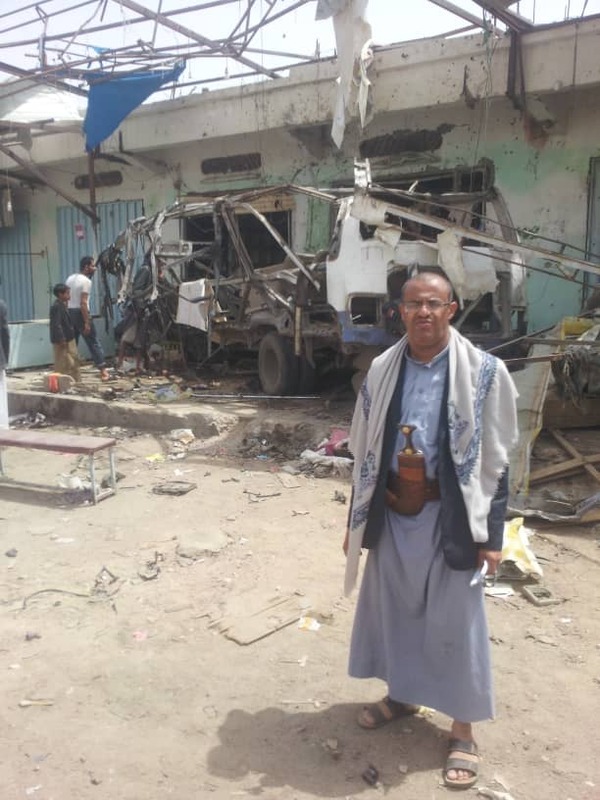 On Aug. 14, five days after the brutal attack, a seemingly emboldened coalition launched new airstrikes, hitting a market, several homes, a medical center, and a mosque in Hodeidah. Thirteen civilians died. Five days after that, more airstrikes reportedly hit fishing boats in Hodeidah. Another 13 were killed. Neither massacre sparked widespread outrage. The same was true three days later when the amendment proposed by Sen. Chris Murphy (D-CT) to end US involvement with the Saudi-led coalition was blocked by Sen. Richard Shelby (R-AL). 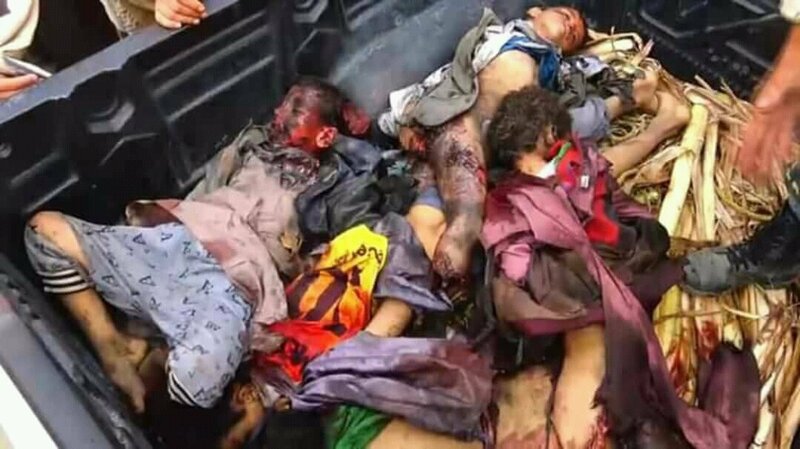 The next day, Aug. 23, Houthi media reported yet another coalition airstrike in Hodeidah. At least 31 civilians, including 4 women and 22 children, all of whom were fleeing the violence, were killed. As images emerged of destroyed little, brown bodies, “Jeff Sessions” trended on Twitter. The attorney general had rebuked claims made by President Trump that he “never took charge” of the Department of Justice, reassuring Americans that “political considerations” would not factor into the commission of his duties. Given that two days earlier, Trump’s former attorney, Michael Cohen, had pleaded guilty to eight separate felony charges, it was a foregone conclusion that any news about the president’s legal woes would dominate the cycle. 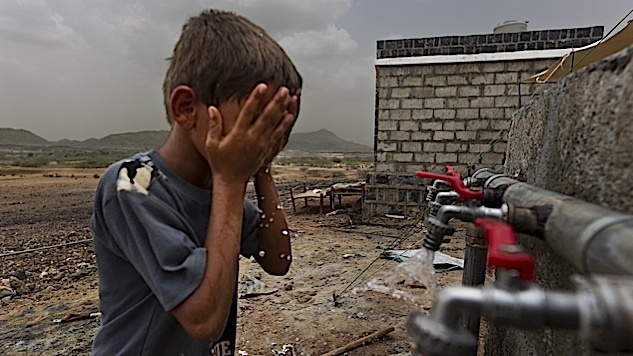 Back in April, United Nations Secretary General Antonio Guterres declared Yemen ‘the world’s worst humanitarian crisis.’ Between cholera outbreaks, famine, and relentless violence, as many as 50 thousand Yemenis have already died. Three quarters of the population—a stunning 22 million people—are in desperate need of food, water, medical supplies, and protection. Half of the country’s medical facilities have been crippled. The situation is beyond desperate, and the world must take notice. It’s time for journalists to give human suffering its due—to prioritize the urgent stories, and to show the graphic realities. It’s time to de-sanitize the news. 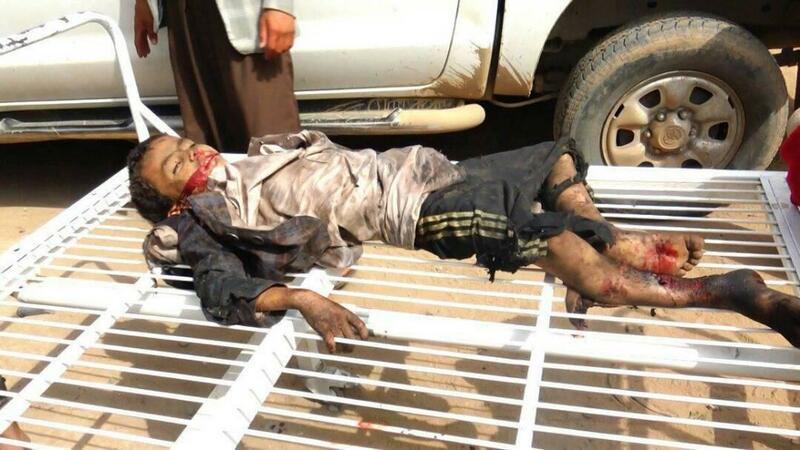 The following photos are classified as “Military information,” and come courtesy of the Ansar Allah Ministry of Defense in Sana’a. Ansar Allah is commonly referred to simply as “Houthi” by western media. 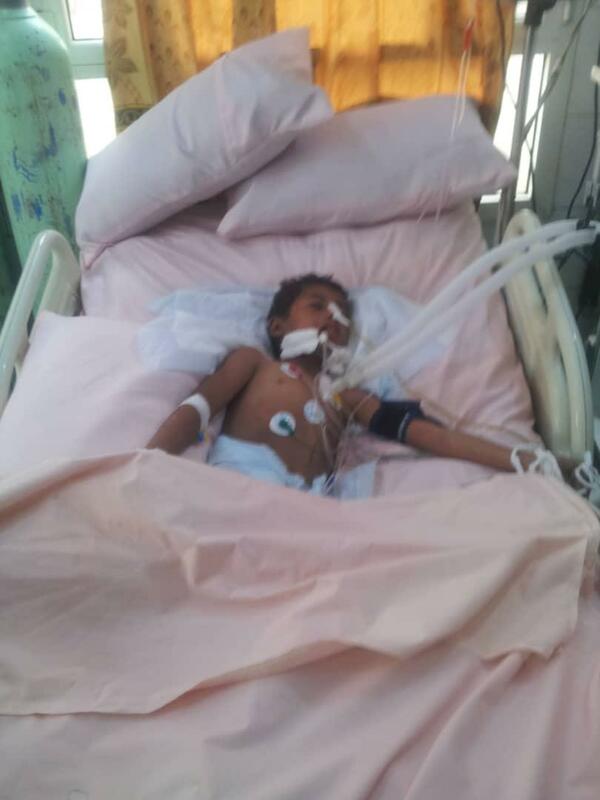 Waleed Abdullah Al-Khulani in intensive care for three days following Saada bust attack. He went into a coma and died on the fourth day.